Distinctive “Knife-Edged” Styling: Love It or Hate It? “The Mayflower was singular — a car of great character, built by and for characters. Road tester Tom McCahill called it a slab-sided tobacco can, a geranium pot, a turnip. Those to whom it appealed nicknamed it the ‘Watch Charm Rolls,’ but others called it many worse things. Sir John Black, however, doted on the little dear, and at Standard-Triumph that was tantamount to automotive sainthood. Sir John got his comeuppance soon enough, when the Mayflower hit the American market: it sold by the half-dozen.” — from Triumph Cars, The Complete Story, by Graham Robson and Richard Langworth, c. 1979, 1988. It definitely was with an eye on the American market that Standard-Triumph developed the Mayflower. In retrospect, however, it appears that eye was not too well focused. The Mayflower was in a number of ways innovative in style and in engineering; at the same time many features were antiquated, and the car as a whole was generally poorly suited to its intended buyers — those Americans theoretically still hungry for new cars after World War II. Unfortunately, the Mayflower missed that seller’s market but was too early for the compact/small import car craze of the late 1950s. In style, the Mayflower was conceived as a “little brother” to the Town & Country/Renown saloons. Unfortunately, it has long been open to question whether the “knife-edge” style worked on such a short wheelbase. Liked or hated, it was quite distinctive, particularly as compared to some of its contemporaries: Austin Devon, Ford Anglia and Prefect Morris Minor, Volkswagen Beetle. The “knife-edge” styling (generally credited to Walter Belgrove of Standard-Triumph and Leslie Moore of Mulliners) proved useful in providing an incredible amount of usable interior space, and the unit-body design made for a very rigid structure. Thin pillars allowed a large glass area that gave a more open feeling, and ventilation was aided by vent windows in both front doors and in the rear quarter lights. Of particular note in the well-appointed interior were innovative separate front seats: as the seatback was pulled forward for access to the rear seat, the seat cushion glided forward as well. In addition to accommodating its passengers well, the Mayflower also carried a fair amount of luggage. The boot lid hinged at the bottom and could serve as an extension of the luggage platform. The license plate and lamp, mounted on the boot lid, swiveled down as the lid was lowered. The spare tire was stored underneath the car, much as is the practice currently with a number of small trucks and SUVs. Mechanically, the Mayflower was a mix of old, new and cost cutting. The side-valve four-cylinder engine was unique to the Mayflower, although it derived from a prewar Standard unit. Especially when coupled with the three-speed, column-shift gearbox, the engine was really not up to the task of propelling such a heavy car at great speeds. However, at least the gearbox featured synchromesh on all three forward speeds. That gearbox, as well as the rear axle, came from the Standard Vanguard. wheels on the Mayflower would also look familiar to a TR owner, but those on the Mayflower lacked the perforations of the TR road wheel. Brakes were also familiar Lockheed units, with two leading shoes in front and leading/trailing shoes in the rear. An “umbrella handle”-style handbrake was located under the dash. A total of 35,000 Mayflowers were built between 1950 and 1953. Included in that total were a quantity of CKD cars assembled in Sweden and elsewhere. Early on in the Mayflower production, a total of 10 dropheads were built. While the Mayflower saloon bodies were built by Fisher & Ludlow, the dropheads were converted from saloons by Mulliners, long specialists in such conversions and long connected with Standard-Triumph. [*] It seems likely that the great cost of the conversion made continued production of dropheads impractical, and the dropheads were long gone by 1953, when the Standard 8 and 10 (see The Triumph 10, 1957-1960 replaced the Mayflower. 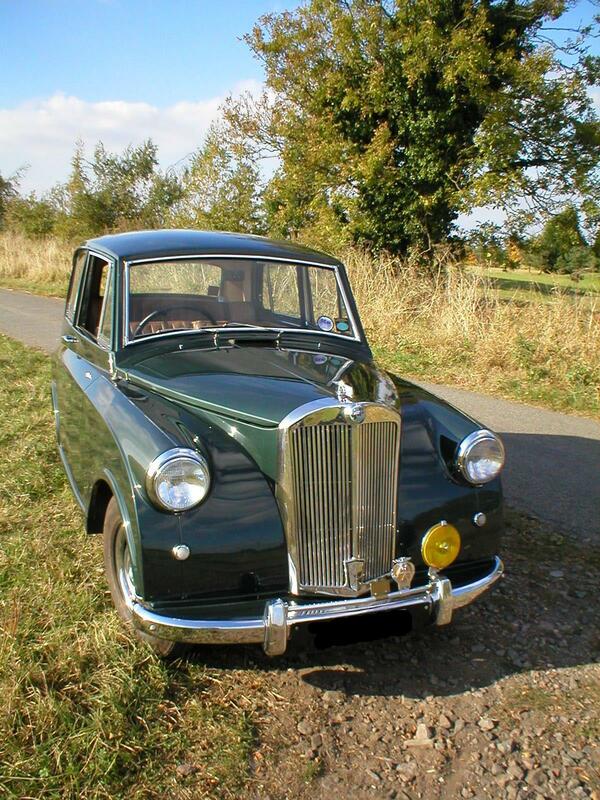 Few (if any) genuine Mayflower dropheads exist today. [*NOTE: Mulliners, taken over by Standard-Triumph in the late 1950s, were responsible for a number of estate car and “commercial vehicle conversions” of Standard products such as the Vanguard and the 8/10/Pennant line and also built TR2-3 bodies. Mulliners also controlled the Forward Radiator Company, who in addition to their namesake product also produced TR3B bodies.] Also included in the 35,000 total are approximately 500 U.S.-spec. Mayflowers imported officially by Fergus Motors of New York City. These cars may be identified by a serially numbered Fergus Motors ID plate on the firewall near the Commission number plate. Not long after Mayflower production began, Sir John Black approached Nash-Kelvinator’s George Mason regarding use Mayflower components in what was to become the Metropolitan. Later on, Sir John apparently changed his mind. The Metropolitan ultimately used Austin engines, but bodies were built by Fisher & Ludlow. Nearly three times as many Metropolitans were built (around 100,000 as opposed to 35,000 Mayflowers); it may not have been a good decision. The Vintage Triumph Register has an experienced consultant for the Mayflower. Owners of Mayflowers are also well advised to join The Mayflower Club. Among other benefits, the club runs a comprehensive spares service for its members. Contact: John Oaker, 19 Broadway North, Walsall, West Midlands WS1 2QG, UK; telephone 01922 33042 in UK or 011 44 1922 33042 from the US.